For the third in its annual series, OMFIF is producing a comprehensive international publication − Global Public Investor 2016 − devoted to public sector asset ownership and management across a range of official institutions around the world. The publication features in-depth descriptions of the investment approach of central banks, sovereign funds, and other types of public-owned investors across Africa, Asia-Pacific, Europe, the Middle East, North America and Latin America and the Caribbean. It provides an accessible guide to the overarching issues that link these different bodies. 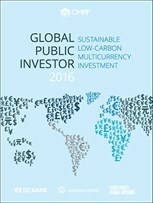 The 2016 publication is focused on two fundamental developments on the world investment scene: the use of a rising number of currencies in world asset management; and the growth of infrastructure and low-carbon investment. On the latter points, Eugene Zhuchenko, Executive Director, LTIIA, published an article on “Long-term low-risk returns GPIs looking to invest in infrastructure” and John Campbell, Chairman of Campbell Lutyens and Advisor to LTIIA Board, published an article on “Stronger greenfield yields, Reduced brownfield investment returns”. Please find below both articles and click here to purchase the GPI 2016 report.